The late and unlamented Hurricane Irene has departed our shores, never to return but has left some vital lessons behind. Authorities were right to hype it in the end. One in two homes in Connecticut, 40 per cent of homes in Long Island without power is a grave crisis in itself. Major highways and bridges closed after flooding, all mass transit ceased , is a clear sign that this storm deserved the attention of the public totally and completely. We can only imagine what damage it would have done if it were category two or three, or heaven help us four or five. When you have tens of millions of people living cheek by jowl along the North East the potential for massive catastrophe is very real. Whether we all like it or not we are part of a fragile ecosystem that is utterly interdependent and dependent on nature's good will. A massive hurricane, which fortunately, Irene was not, would have catastrophic consequences for not just the North East but the US itself. Nature's power teaches us humility and how much we take for granted electric power, light, water, air conditioning etc. On Sunday morning millions were catapulted back to the MIddle Ages and it was not a pretty prospect. No laptop, no phone or ipad, no freezer, no gas , no traffic lights no mass transit, no nothing. 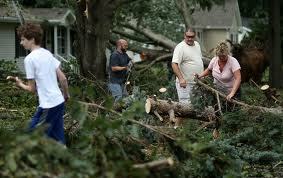 Thank you Irene for making us aware of the sober lessons that nature's havoc can wreak. And just let's be thankful it wasn't a whole lot worse.